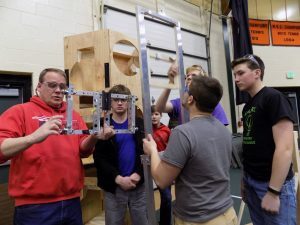 JAY — Spruce Mountain Area Robotics Team 3930 (SMART) is two weeks into the build season for this year’s FIRST Robotics Competition (FRC) and realizing how much engineering is involved. Monday SMART members spent much of the day at the high school. Mentor Rick Dorey was helping Hannah Coates cut lengths of electrical wiring. Lemieux cut a piece of wood from a model that would eventually be a metal structure. The final design will be used to place hatches on the game’s rocket ship then deliver cargo to the ship. One challenge comes from the 48 inch limit on the height of the robot but having a 76 inch high portal where some cargo pods must be delivered. SMART plans to use a cascade elevator to lift the pod (a bright orange ball about the size of a soccer ball). Drew Delaney suggested making the elevator’s carriage smaller to get it to reach higher. Orion Schwab said the problem is the cargo is too low and a way must be found to get it higher. The FRC game this year is a tribute to the first walk on the moon which happened 50 years ago. 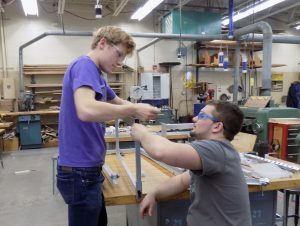 Alliances made up of two teams compete against each other. Each alliance has two rockets, a cargo ship and a habitat area. Points are scored by attaching hatches to the rockets and cargo ship so that cargo pods can be loaded on them. Returning to the habitat before the end of the match will also earn points. The winner is the alliance with the most points at the end of a match. SMART has just under four weeks to finish building and programming its robot. 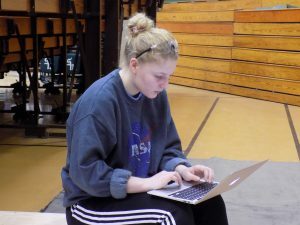 Team members are also working on a business plan, the Chairman’s Award essay and video and spirit materials for the FRC Destination: Deep Space game.